Our community of marketers and salespeople shared the free software tools that they use to eliminate manual work and spend more time making progress to goals. 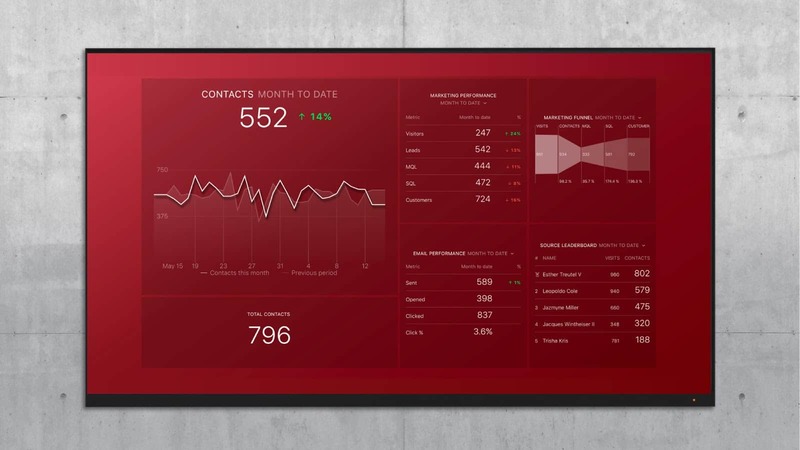 Have you ever spent a long afternoon logging data into a spreadsheet, pasting emails into your customer relationship management software or trying to create simple graphics with complex design tools? Pretty much EVERY marketing and sales expert has a list of tasks like these that they dread all week — or all month even! Usually, the worst tasks involve senseless repetition for hours on end. May times it’s because two software tools don’t work with each other or because it takes 15 clicks to get to the functionality you need in a specific app. Frustrated with a few of these tasks ourselves and reluctant to keep spending more on software, we polled our community to learn which free tools have been lifesavers for simplifying these annoying processes. A lot of these answers came from experts at marketing agencies, since they have an especially large need for free sales and marketing software, since they must repeat tasks like these for every single client! In some cases, the free software tools on this list have paid versions that provide even more functionality, but in order to be included in the post, the free version had to solve a real problem and be free-forever, not just provide a preview or a free trial. Without further ado, here is how the marketers and salespeople in the Databox community are filling gaps in their process with free tools. 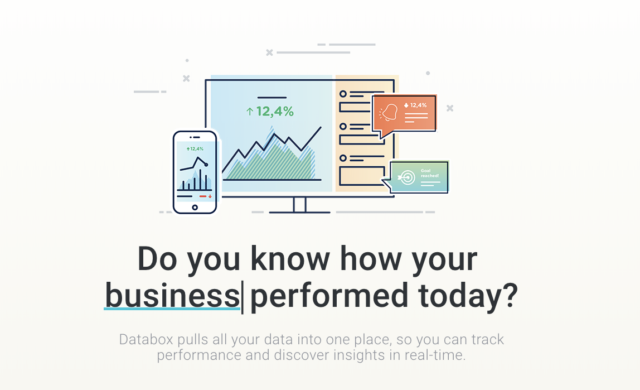 Why I Like It: Databox is great if you wish to see the broad picture of your marketing activities TODAY (and not after weeks of tinkering with hundreds of tools and connectors). It also allows you to communicate with stakeholders very efficiently. We have used it for short time, and we already love it. What I Previously Did: Spreadsheet, docs, dashboard integrated into platforms. Paid Version Available? Yes. Note: Databox has both a Free account and an Agency Free account just for agencies. Why I Like It: There are a number of free design and marketing tools I could talk about here: ScreamingFrog, SEMRush, LastPass, Trello, Soapbox, the list goes on, but I’m going to go out on a limb and say Canva. There are plenty of free, high-quality productivity and analytics tools out there to help marketers and sales professionals in their day-to-day, but I’ve found very few design tools that enable non-designers like Canva. I am fairly proficient in the Adobe Creative Suite, but for those that aren’t, Canva allows them to create high-quality, perfectly-sized visual assets for a variety of social media platforms (and their paid ads), email, blogs, and even print. Whether you need a quick graphic for a holiday greeting or a full infographic, Canva’s library of icons, templates, fonts, etc. makes it fast, easy, and fun to do. With it, we can still present and maintain a professional, consistent visual brand, without needing our trained designers to drop everything to make it happen. 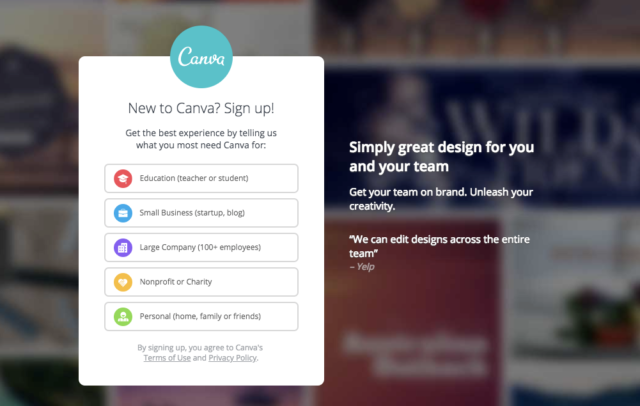 What I Previously Did: Before Canva, we had to rely solely on team designers to create all visual assets. It created capacity and efficiency issues especially when we needed something quickly (i.e. social graphics). Why I Like It: If you’re a successful content creator today, you know how important it is to produce great images on your blog and social media channels to increase engagement and brand awareness. However, if you’re anything like me, who does not have a graphic design skill in his body, you’ll find Canva to be a lifesaver. There are great places to find low-cost stock imagery all over the internet. But if you really want to stand out in the crowd, you must personalize those stock photos to enhance your brand. In my opinion, Canva is the simplest graphic design tool if you’re not skilled in the popular Adobe suite of tools. What I Previously Did: Before Canva, I would end up frustrated trying to edit images in Photoshop. The learning curve is steep and it would cost me time. I would also have to pay expensive design fees that were just way beyond our budget and wait days to get them back. I got all that time and money back with Canva. Why I Like It: With RecurPost you can quickly schedule all your social media updates on multiple social platforms. The difference between RecurPost and other tools is once you have put your update in, it will automatically share it again based on the schedule you set up. This saves hours each week, and helps me get the most out of each piece of content created- all for free (for 3 accounts). What I Previously Did: Before RecurPost I used different tools, including Hootsuite, Buffer, and MeetEdgar (which I still use for some clients / accounts). Why I Like It: This tool is the best. This tool allows you to schedule and post directly to Instagram. No push notifications to your phone just direct publishing for both personal or business accounts. You can tag anyone, use hashtags, add emojis just like in the app. It gives you desktop access and allows you to publish in real time or schedule posts for future publication. Unlimited posts, swap between multiple accounts with one unified login. I have been using this tool for 2 years with no issues. What I Previously Did: Before this tool, I had to be on call to post to Instagram from my phone. I could not schedule posts for the future which means I had to stop what I was doing and attend to the post. Very limiting and cumbersome. Why I Like It: It allows others to share specific Tweets you create for FREE, enabling you to reach new audiences, get more Twitter followers, get more blog visitors, get more subscribers, sell more products/services, and thus, earn more money! What I Previously Did: I used to rely on ONLY my blog readers to share things on social media. Why I Like It: Hootsuite is a social media management platform, where you can schedule social media posts to sites like Facebook, Twitter, LinkedIn in advance. Hootsuite also has social media monitoring and analytics tools that are helpful for staying on top of industry trends and analyzing your brand’s social media presence. Why I Like It: Users browse the web with dozens of tabs open. One website leads to another, which leads to another and after a few minutes your content is lost in the sea of tabs. TTAG allows you to kindly remind the user to visit your page by scrolling text right on the browser tab. What I Previously Did: Before this tool, no one really thought about this as a problem. The idea is very similar to Facebook, Twitter or any mobile app notification. It’s just a slight reminder to return and view the content. 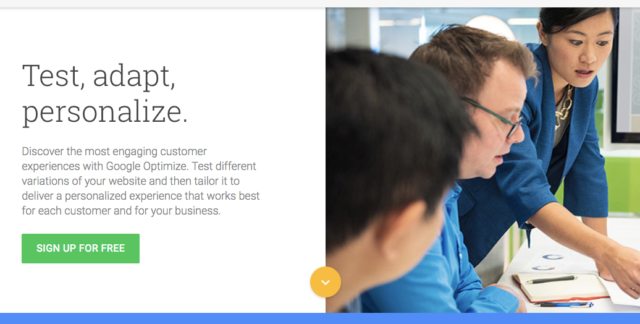 Why I Like It: Google Optimize enables marketers to run AB and multi-variant tests directly on a web page. It is extremely easy to setup one of these tests directly within the system, and the data integrates directly with Google Analytics. What I Previously Did: We used Optimizely, but they got rid of their free option. Why I Like It: As a frugal entrepreneur and marketer, free online tools have been a mainstay (or requirement) in my arsenal. 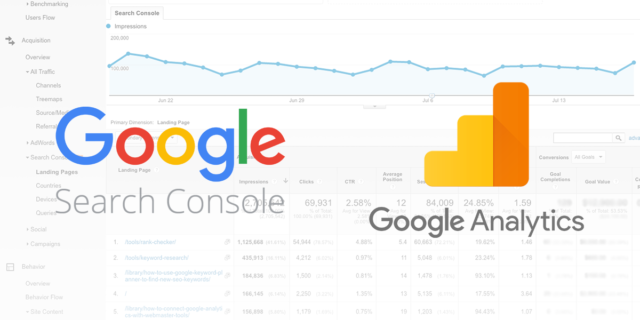 For information about website performance, most people go straight to Google Analytics, but I always like to also check out the versatile tool Google Search Console (formerly known as Google Webmaster Tools). It allows webmasters to check on indexing status of your pages, keywords, search impressions, CTR, and ranking for keywords. It also allows you to quickly and easily submit sitemaps or submit individual pages to index. You can also check to see if there are any crawling or indexing errors or pages that aren’t mobile friendly. There are countless other features but it’s a great free and user-friendly tool for webmasters or bloggers of all levels. What I Previously Did: I used other similar or complementary free tools as well such as Google Analytics, Semrush (free version), and Moz Open Site Explorer (free version) primarily. There are some other free options as well but they are usually less versatile. Why I Like It: Google Search Console is one of the most under-utilized free tools out there. This tool allows you to see what keywords and pages on your site are already ranking in search results and get an idea of which ones are getting good insights but no ideal results. By optimizing your content for better click-through rates you can start to see instant lifts from organic traffic results without having to create new pages or blog posts. Ever since the loss of keyword-specific organic traffic reports, it’s been much harder to understand which keywords are driving the lion share of the results to your website. This tool helps put some of that data back in your hands. With other tools that allow you to check the external links to your site, view indexing errors that need to be resolved and submit your site pages to be crawled by Google, there’s no reason not to add this tool to your marketing toolkit. What I Previously Did: There are a variety of other tools that can give you pieces of this data, but Google Search console really gives clear insights into what content is being shown in SERPs and which queries are actually generating results. Track Search Console Data in real-time with the Search Console Basics dashboard. Why I Like It: It’s great for researching keywords and outlining a pay per click campaign based on results. Gives you a good idea of competition, search volume and how to establish a budget needed for a PPC campaign. Why I Like It: Screaming Frog SEO Spider is one of the top (if not the best) SEO audit tool available. Screaming Frog SEO Spider provides a comprehensive audit on your client’s website to maximize SEO effectiveness. The program also helps organize your SEO work to ease navigating, updating and fixing your site in just a click. As the program crawls through every page of your site, Screaming Frog SEO Spider develops a roadmap for you to understand what needs to be done, what needs to be improved and what needs to be fixed! Why I Like It: UberSuggest, is a free keyword tool that allows you to enter the main keyword you want to optimize for. Then, the tool provides you with keywords related to it that are based on Google’s autocomplete search feature and Google suggest. UberSuggest was purchased from Neil Patel in March 2017 and he has greatly improved the tool. It now also provides you with Google Keyword Planner results, but you can turn that off if you want. It provides you with search volume, CPC (Cost Per Click) as well as competition level. The best part is that it allows you to export the results to a CSV file. For a free SEO tool, it is fantastic, especially as a free keyword tool. It saves you a lot of time and the results are very detailed and can lead to many keyword opportunities you didn’t think existed before. What I Previously Did: In order to find Google autocomplete keyword opportunities, you would have to manually type your main keyword into Google search and then see what the suggestions were and then manually type the results down. It was very time consuming and tedious. UberSuggest automates all of this for you for free. Why I Like It: This is one of the best keyword research tools available. It’s brilliant for finding long tail keywords and understanding more about what exactly your customer is searching for. Results are automatically generated based on a keyword and provided by Google & Bing. It is a brilliant for both marketing professionals and small business. Once you submit a keyword, a comprehensive view of questions about the keyword is displayed. 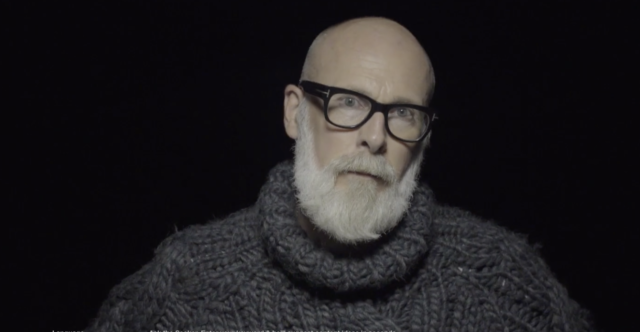 This provides a great insight into the motivations & emotions of the people behind an everyday search term. It’s fantastic for content marketing, which is one of the top SEO strategies. What I Previously Did: I would go to Google and see what Google would suggest as long tail keywords. I would also check the similar search terms at the bottom of Google’s SERPs. Why I Like It: Marketing revolves around content and as a digital marketer we are always looking for content ideas. Answer The Public’s enables us to find topics and questions the “public” are searching online. When you input a target keyword, it comes up with hundreds of ideas we can use as blog articles subjects. Longtail keywords (questions & longer queries) have a higher conversion rate and less competitive, so it’s a no-brainer for marketers. Take these keywords and add them into Google Keyword Planner, and you will find a goldmine of popular keywords. What I Previously Did: We would use a combination of tools such as Google Suggest, Google Related Searches, and Google Keyword Planner to find keywords. Answer the public goes deeper and faster, saving us time. Why I Like It: You can set up paid tools like SEMRush and Ahrefs to do automatic search engine results page (SERP) tracking for you, but this is limited to tracking searches by country. These paid tools make it easy to see your page one rankings on the popular search engines on a wide scale, however, they do not give you a localized look at what is ranking in smaller geographic regions. For truly localized data, I use Moz’s free Chrome extension, their MozBar, to set up search profiles for tracking my clients’ location-based rankings. For example, my one client sells products in Minnesota and South Dakota, so when I Google search “storage sheds” from my computer’s location in Lancaster, PA, it’s not an accurate reflection of what people are finding when searching on devices within those other states. With the MozBar, I can set up Google, Yahoo, or Bing city based targets so I can see specifically what users are seeing when they search in their customers’ target areas. I couple this with another free Chrome extension called Full Page Screen Capture and quickly take a screenshot of the entire results page and store it for reference of their positioning. What I Previously Did: Before finding this tool, I would manually enter at the end of the search page URL a string of “&near=” and the ZIP code of the city I wanted to track. Then I would log in my client’s ranking position for that keyword in a spreadsheet. I would do this once a week, and it was rather time-consuming. Now I can more easily toggle through the search profiles by location and just take a quick image to compile at the end of the month for a monthly report. Why I Like It: MozBar is a browser extension that gives you instant metrics on any web page or search engine results page you’re viewing. It lets you view page and domain authority and identify keywords. You can even compare link metrics across multiple pages while viewing a search engine results page. Basically, it gives you a quick view into how awesome, or not-so-awesome, a website or web page is in terms of SEO. We like to use it to look at competitor’s websites, and then use it on our own so we can dream about having as many backlinks as they do. We also use it to dive into our client’s SEO metrics. It’s particularly useful when we get a new client and we need to do an assessment of their website. We recommend it because Moz is an authority on SEO, it’s free, and it’s easy to use. “Vanilla” search will start to feel like “blind” search after you’ve used it for a while. Naturally, there’s also a paid version that gives you more info. What I Previously Did: There are plenty of websites out there that let you copy and paste a URL into a field to get metrics. We used to use these. Some of them are about as useful as MozBar, but you have to keep re-visiting their website. Some of them even have limits on how many queries you can put in. MozBar eliminates the need to go back and forth to get that information. 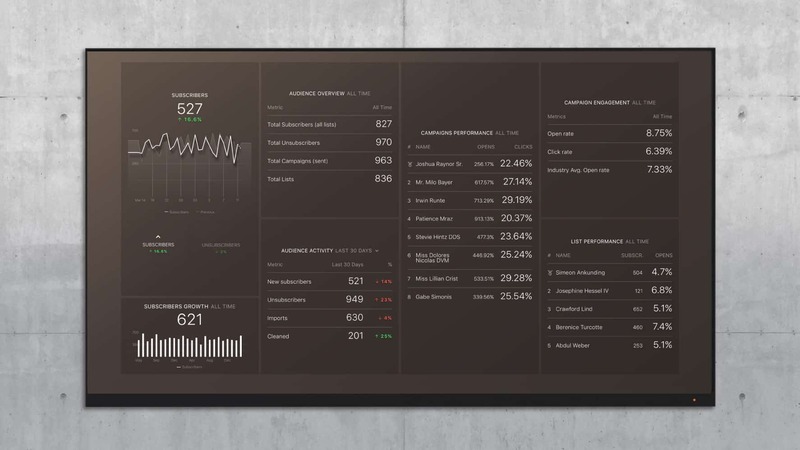 Why I Like It: The MozBar is a must-have tool for any real-time data junkie. I put it to use daily for link building strategies and competitive analysis. It provides instant link metrics from any SERP or web page. Right from SERPs, you get an immediate snapshot of authority scores, spam scores, backlinks, keyword difficulty and more for each result on the page – that’s incredibly powerful. This instant access lets me know what I’m up against, on the spot. On-page analysis tools allow you to highlight internal and external links and review page elements (title, H1, meta, etc.) without having to view page source. This instant access makes this tool the most used in my research process. What I Previously Did: The same data is available in most SEO research tools, but the time needed to do this research made the task daunting. I’m saving hours and able to share deeper-dive data and analysis with our clients with my MozBar! Why I Like It: Apart from providing an exhaustive SEO audit, it helps us do keyword research, giving us all long tail keywords, Google Autosuggest terms as well as (Latent Semantic Index) LSI terms. It also helps us find focus keywords for the content we produce. What I Previously Did: We were using the paid version of Moz for the audit. The keyword research part was handled through a mix of Google Keyword Planner, Ubersuggest, and SEMRush. Now we can do all of that in one place. Why I Like It: The Yoast SEO plugin is the best tool there is for optimizing a WordPress site. It allows you to add page titles, meta descriptions, and more – along with simple-to-follow recommendations for optimizing your page or post. It’s a must-have for helping your website rank higher in search engines. The paid version also makes it easy to add 301 redirects throughout your site. What I Previously Did: We’ve always used the Yoast plugin for as long as I can remember. Why I Like It: You can use HubSpot to streamline and automate sales (CRM, sales sequences, meetings) and marketing (email, blogging, lead nurturing, landing pages, and more). It’s awesome having everything in one place. Sales and marketing teams need to work together. With HubSpot, you can set up campaigns, schedule blog posts, automate social, set goals, generate leads, automate email workflows to nurture leads, book meetings, and close–all in the same tool! What I Previously Did: We would not be able to accomplish everything we do without HubSpot. I suppose you could try cobbling together a bunch of separate tools to handle some of the work, but the best thing about it, in my opinion, is that it’s all in one place for everyone–sales and marketing–to access and use. Why I Like It: HubSpot’s Free Marketing Suite provides businesses with contact forms, lead capture pop-up forms, a contact database, traffic and conversion analytics, and it integrates with Content Management Systems (CMS), email tools, and form tools. We recommend this tool for new websites that are looking to convert website visitors into leads, and nurture their contact database with email marketing. What I Previously Did: Before HubSpot many of our clients used email newsletter services like MailChimp or their personal address book to manage email addresses. This works when your company is small, but quickly becomes problematic when you add more team members and contacts to your database. 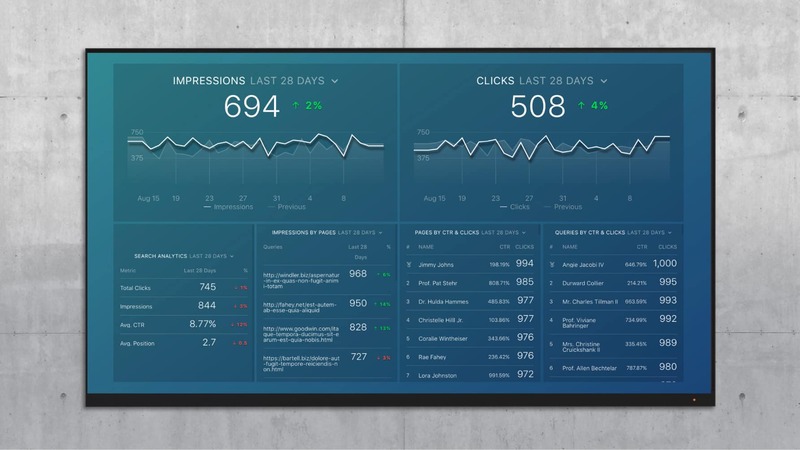 Track all your HubSpot metrics in real-time with the HubSpot Marketing overview dashboard. Why I Like It: This free email tool allows you to create lists and send emails to specifically selected lists. You can use personalization tokens so that it is customized to each person as much as possible. The lists could be embedded to your website so that you can grow the number of subscribers. This is a great tool for those who are looking to get started with Email Marketing. What I Previously Did: Many years back, I used to do mail merges with Outlook. It was annoying and there was no tracking. MailChimp allows you to create beautifully designed email which you could do on your own or play around with their library template. Track all your key MailChimp metrics with a MailChimp basics dashboard. Why I Like It: Trello is, at its core, a project management tool. It allows you quickly organize tasks as cards onto a board, where you can track what’s being worked on, who is working on it, and how far along that task is. Each card has a place on the board, and once that card is ready for the next stage, you then move it to the next appropriate list. Assign due dates, make comments, add members, and attach files or checklists to get the most out of this tool. Power-ups can help you customize Trello to meet your objectives. Although Revenue River uses a different, more robust project management tool too, we still use Trello for a lot of our internal organization. When you need a simple, visually appealing way to organize ongoing tasks, share updates with a team, or even build a team of Instagram contributors (Trello image uploads maintain full quality), Trello is the reliable and user-friendly choice. What I Previously Did: Before Trello, we used Asana to manage projects and shared sheets/documents to keep track of other task lists. Although we’ve moved beyond Trello for project management, it still has a place in our toolset because of its simplicity. Why I Like It: Trello is project management, a to-do list, a repository, a planning tool, and so much more. It allows for a lot of versatility in how you use it, allowing you to have one platform for managing your marketing team… or even your whole business. There are more robust systems out there, but that’s just overkill in smaller organizations like ours. What I Previously Did: Before Tello, we had different tools for everything! We would have to check into five different dashboards to get what we needed. Why I Like It: Most of the things I use are paid or lifetime deals. If there’s one software that I use for marketing or sales that is free, it’s Trello. Sure, there are dozens of alternatives out there, but I’ve stuck with them over the years and it’s free. I manage a sales CRM and use other boards for planning projects or blog content calendar. I also use it as a roadmap showcase for my app startup. What I Previously Did: I used to do my content calendar on paper, then moved to iCal/Google Calendar. Roadmaps were limited to photoshop and marketing efforts we limited to Excel checklists or Google Sheets checklists. Why I Like It: This tool is a game-changer, because it connects to your accounting or payments systems and shows you all the SaaS products you use (yeah– even those you forgot about! ), broken down by cost and time. And subscription terms. We’ve implemented this tool and were astonished–no, flabbergasted– at the volume and breadth of tools adopted inside our growing organization. Seeing them all in one place, and having an accounting for them, is positively brilliant. What I Previously Did: Poorly cobbled-together audits of software licenses in Excel. Time-consuming, incomplete, and more importantly disaggregated–we had a poor handle on 35 core SaaS tools used. 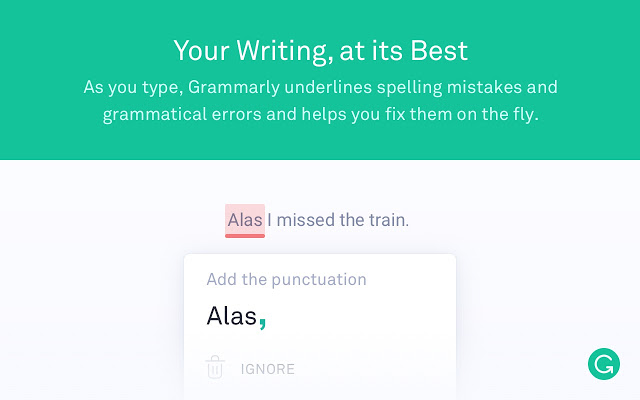 Why I Like It: This tool proofs any of your writing on the web for errors. What I Previously Did: Many times, if I were writing a comment or a longer piece of content I would write it in a word doc to make sure there were no grammar errors. Why I Like It: SimilarWeb gives you insights the traffic sources for a particular website, and gives you the ability to list and compare competitors of that website. What I Previously Did: I used to use Alexa.com but found Similarweb to be more accurate. Why I Like It: LinkedIn Website Demographics is a free tool that allows you to see the demographic data of your website visitors that have LinkedIn accounts. You get data on their job title, seniority, industry, location and more. You just have to enter a code snippet like you do with Google Analytics to get set up. What I Previously Did: We would manually sort through our new leads as they came in. Why I Like It: Capturing folks in a moment of intent is critical. Drift is a messaging app for your customers and prospects that lives on your website. Aside from delivering what I believe to be the best “chat app” user experience (on both sides), David Cancel (who helped to build the HubSpot platform before its IPO) and team are building a next generation sales/customer success enablement product. The mobile app allows us to take conversations on the go. This is a gamechanger for bringing sales teams into the conversation with prospects already on the company website. New features are shipping all the time, including email sequences for sales teams and more. What I Previously Did: We used to use live chat with a tool called Olark, but at the time, it did not have a proper mobile app, so we never fully adopted it. We’ve tried other ones along the way, but none I have seen have made the process as seamless on both parties as Drift. 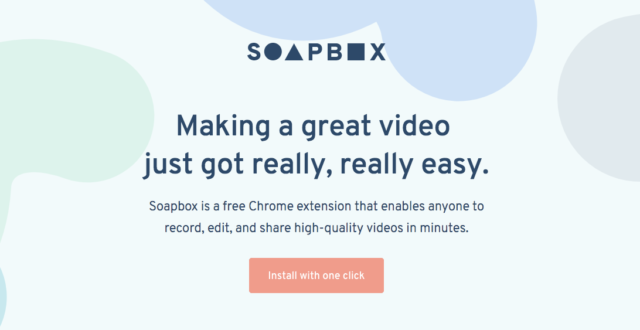 Why I Like It: Great free tool, VERY easy to create simple videos for embed on your website or as a sales tool in your email. I was up and running in like 3 minutes and have seen great results from including in my email signature. It’s just a simple Chrome extension. What I Previously Did: I used to shoot video on my phone or use my webcam then needed to host the video somewhere on youtube, Vimeo, etc. so many more steps. Soapbox is much simpler! Why I Like It: As an agency, I always find it extremely helpful in my sales process to be able to assess a prospect’s tech stack. Do they use a certain marketing automation tool, a CRM, retargeting tools or CRO tools? If they have plenty of tools running on their website, it tells me that they are investing in marketing and they are probably constantly looking for more opportunities to improve. This makes my prospecting job easier, and it helps me to assess how mature a client is. What I Previously Did: Manually checking their source code or I would just guess. Why I Like It: This chrome extension allows me to quickly review businesses’ digital marketing footprint and the technology they use. This is done through the tracking codes on the websites and the code they use. This, in turn, allows me to make an educated guess on their digital marketing strategy and the level to pitch prospects our services and products or to identify gaps. These tools also allow me to look at bigger websites and analyze and review any areas we can learn from in terms of traffic or tool opportunities. What I Previously Did: We didn’t use any tool as we had no insight into the websites technology stack. Why I Like It: If I had to choose one, I would say YouCanBook.Me has made the biggest impact on my day-to-day routine. It’s the best online scheduling app we’ve found, yet. The free version lets you control daily availability. It also allows you set default time blocks, customize your calendar appearance and reminder notifications. What I Previously Did: Scheduling meetings used to take up to 3-4 emails to find a time that works best for both parties. Now, it’s as simple as sharing a link to your personal calendar. Why I Like It: Linked Hub is a messaging software for LinkedIn that integrates with HubSpot. What I Previously Did: I was using a vendor’s propriety software that was costing $165 per month – and it didn’t integrate with HubSpot! Why I Like It: Zoom is the ultimate communication tool. At a free level it supports conference calls, video calls, screen sharing ability to make recordings of video and screen shares and more. It’s a full product even as a free tool but it just has a time limit per call. That time limit was 40 minutes when we started using it. But you could just start up another meeting right away. Even the free version supports the Zoom app on your phone so you can take a video call from your car. Today, you need to be able to do face to face business without being in the same room, the same city, or even the same country. There are tools that do this but none are as easy as Zoom. Zoom has allowed us to do high levels of collaboration with teams, partners, and our family of customers with ease. By creating “remote” habits in the HQ, it allows you to create an environment that doesn’t isolate remote members of the team. You can build a hybrid team and remove the barriers that can normally exist. What I Previously Did: Before Zoom I rifled through several known meeting and conference software tools. I think we used at least 4 or 5 different ones in under 24 months. They all were missing something. Zoom had all of the missing pieces. 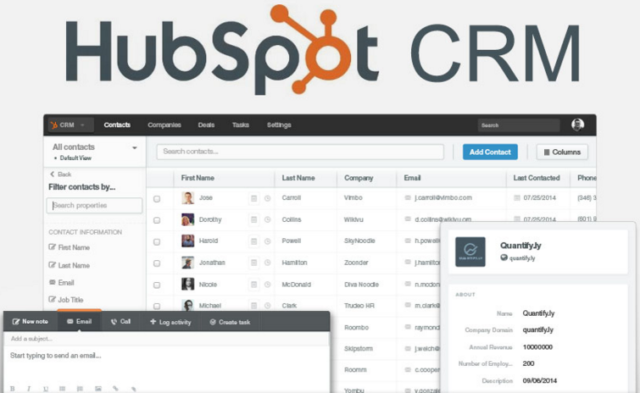 Why I Like It: When HubSpot launched the CRM, I immediately fell in love. It’s clean, simple, and fast. It has helped my team organize our very dynamic sales process and spend more time focused on action and spending time with buyers. I use Views to organize contacts into accessible segments based on the engagement and interests. The visual deal pipeline has become a powerful way for my team to get a handle active opportunities. Since converting over to the HubSpot CRM, we have seen far fewer leads and deals fall through the cracks. Our response rates for leads has improved by a factor of three. Plus, we now spend more quality time discussing creative strategy around our sales process based on data, as opposed to guesswork. What I Previously Did: We tried a number of tools before the HubSpot CRM, including Highrise CRM, spreadsheets, and Salesforce. 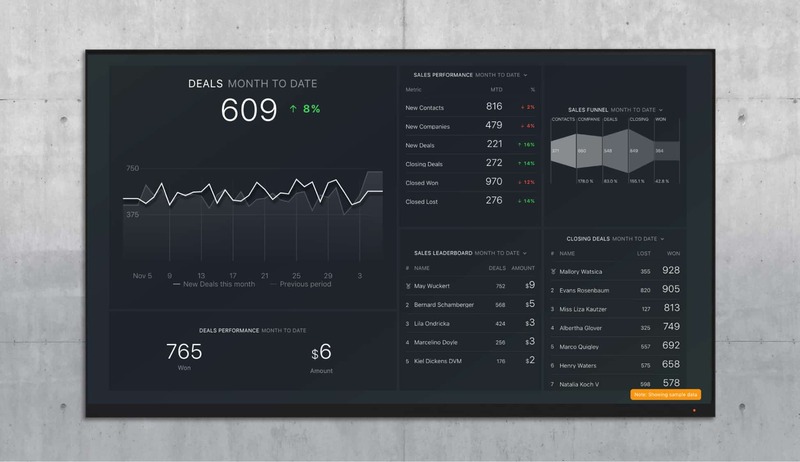 Track your favorite HubSpot CRM metrics in one place with the HubSpot CRM overview dashboard. In compiling this list, I learned about a bunch of new tools we’re going to try here at Databox. The validation from other experts helped me wade through what seems like a barrage of new free tools released every single day. And it’s not just startups offering free software these days; even publicly listed companies are offering free versions of their software. 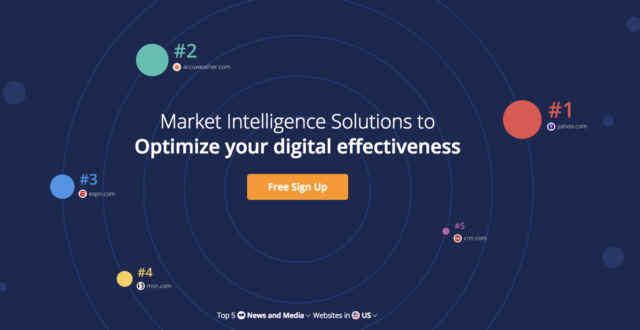 What other free marketing and sales tools do you recommend? If you have a suggestion for our list for a tool you’re willing to endorse, complete this form and we’ll update the post. Follow people and companies on Quora and Product Hunt. Join online communities like Inbound.org, GrowthHackers and Saleshacker.